"This is a wonderful service you provide. It is very difficult to obtain all of the materials needed in a classroom, especially for special needs children due to low budgets and high-priced materials." 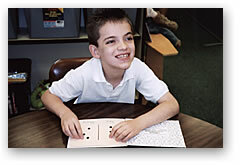 ​​​The Oakmont Visual Aids Workshop provides free materials to anybody working with children who are visually impaired and/or have ​special needs. ​The learning aids are made by hand by a group of volunteers living at Oakmont Village, an Active Adult Community, in Santa Rosa, California. For more information, explore our website to learn more about us, view our products and place an order. Please mail a donation to help with the cost of materials!